The Beaver House earned its name through conscious planning and design. Since the home was built in Nordelta, a gated community on the north side of the Tigre Partido, Buenos Aires, the structure is situated on the edge of a waterway, just like the meticulous homes of nature's engineers—beavers. 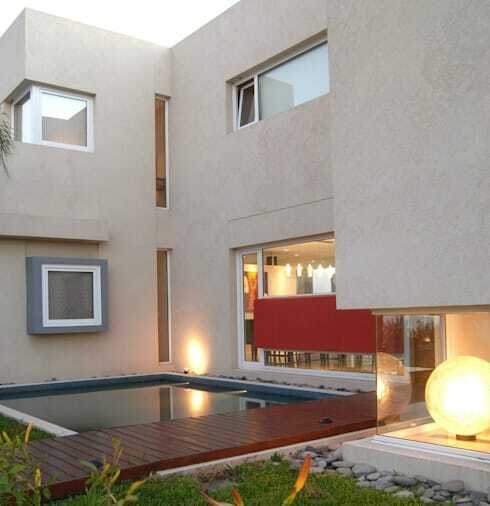 The location for this home was just as important as the actual structure, as the clients were looking for a plot of land close to the Nordelta central lagoon that offered prime visual prospects. Well, they definitely found the right spot! Argentinian firm, Ramirez Architecture, took upon themselves the task of creating a balance between landscape and construction. 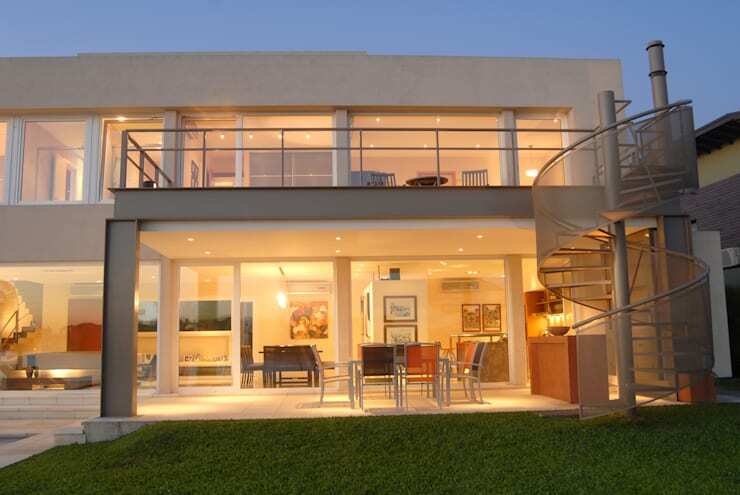 Due to the location of the house near the lagoon and the preferences of both client and architect, water had been an integral part of planning the structure from the very start. As we will see in the images of the house below, water—both as physical substance and as symbolic element—has been incorporated into the design of the house as to form part of the inhabitant's daily lives. Above and beyond all of this, the Beaver House is a stunning modern home. Today on homify, we will treat you to a tour around this lovely structure! The Beaver House is located in a quiet cul-de-sac of the neighbourhood, contributing to the peacefulness of the lagoon, since this is a low-traffic area. It is evident that every part of the project had been well thought through during every stage. The challenge in this project was to create a home on the human scale, which is not too lavish and overwhelming, whilst not wasting the generous space available on the plot of land. 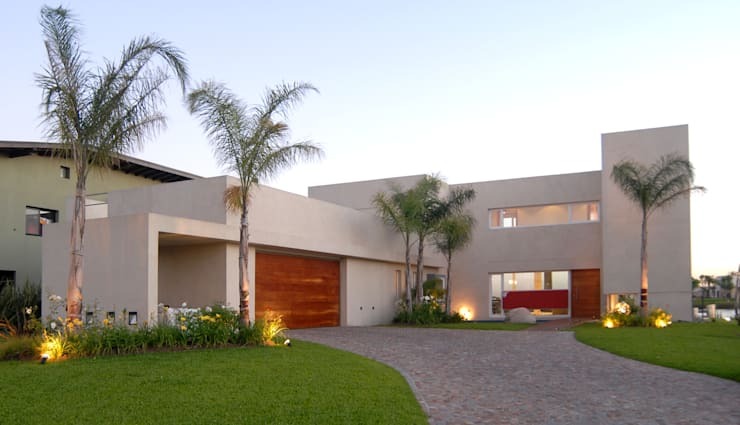 For this reason, the house was built more to the front of the plot, leaving space for the pool and recreation areas closer to the lagoon and its charms. The structure itself consists of several bold, geometric volumes which has become very popular in modern architecture and design. The colour of the walls is of an unimposing pale rose variety, complemented by wooden doors for the entrance and the garage. Overall, it is a minimal façade with maximum positive impact due to its gentle nature and the inclusion of indigenous vegetation. On the other side of the home, viewed from the back yard, we can see that the two volumes of the house were designed with the scenery in mind, as both levels have windows spanning across the width of the façade. Not only does this mean that the lagoon and surrounding environment can be seen from almost anywhere in the house, it also displays the warmth of the home's interior to the outside world. The architects wanted to create a designated reading space in the house, in addition to the various areas dedicated to studying, relaxation, entertainment and any old household need. From this vantage point we can see this dedicated space on the top floor, close to the wide open and clear window, as to allow for constant tranquil scenery while being submerged in your favourite book. To the right of the image we can see a spiral staircase from the upper to ground level on the exterior. The shape of this staircase and the subtle materials used for it mimic the free flow of water from one point to the next. If spiral staircases are your thing, get some more inspiration from these: Awesome Spiral Staircases Designs. The commitment and connection to water we spoke about is apparent from the very start—in order to enter the home you have to cross a bridge across a calm feature pond. The water feature is a square shape nestled in the structure of the building and surrounded by the house walls. Although this is largely an aesthetic element, it has much more value than what meets the eye. In addition to looking charming with any building, it also provides a sense of calm and comfort to everyone before even entering the house. The wonder of water! The simple and broad wooden walkway that spans across the pond to the front entrance of the home is constructed of the same wooden material we saw in the previous picture used for the garage door and the front door itself. It contributes to the natural theme of the space, and creates continuity in the design of the façade. As if it wasn't enough that the house is situated on the edge of the lagoon, the property also hosts an amazing swimming pool. The large feature extends from the porch in front of the living room window outward towards the lagoon itself. What we cannot see from this angle, but what was the architect's intention, is that if you stand on the inside of the home in the living room and look out through the window, the swimming pool seems to be superimposed on the landscape and creates a link between the natural and artificial volumes of water. As we have said before, water is an integral part of this home and its daily functioning. The most obvious of examples is that the house is surrounded by water, and that no day can go by without awareness of this. And who wouldn't want to? With the extraordinary view of the lagoon at your doorstep, and a swimming pool nearly integrated into the natural body of water, you must feel completely in harmony with the natural surroundings. 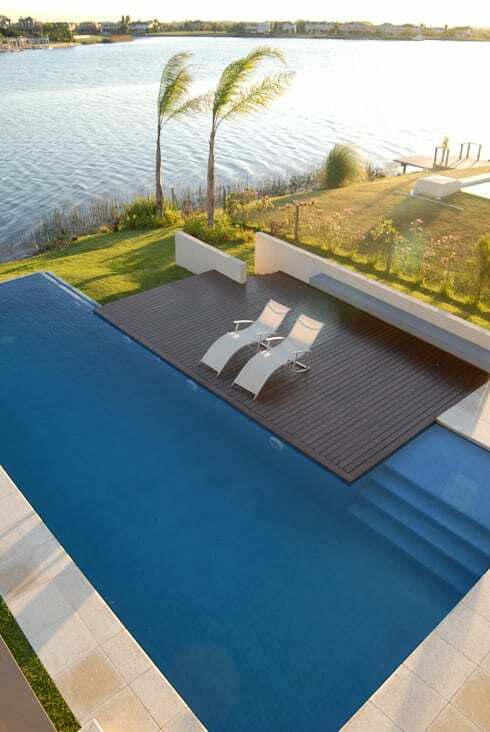 Next to the extended rectangular pool, we see a wooden deck fitting into the pool like a puzzle piece. Beyond this it's all sun and endless water. What did you think of the pool so close to the lagoon? What else did you like about the home? Let us know what you think!